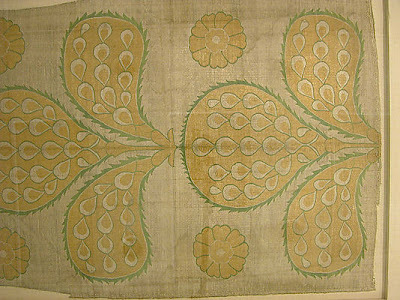 Continuing with more metallics, the textile of the day is an old Turkish silk with metal wrapped thread. At one time it was part of a kaftan and, according to The Met, the super-largescale pattern was intended to attract attention from a distance. So if it seems a little bold for clothes, I think that was the point. But with the pattern re-imagined for furnishing fabric, this design would be right at home in the 21st century. F.Y.I., the seraser technique used here in The Met's piece was only done by a small group of artisans. 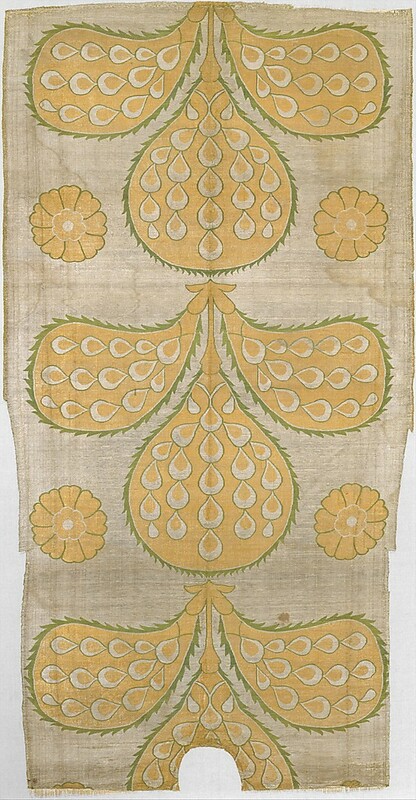 Known for creating larger-than-life patterns, they wrapped yellow or white silk yarns with ultra-fine strips of gold or silver foil. The fragment is also featured in this Met catalogue.